The processes used in manufacturing processors has been shrinking ever since the IC was invented. In the 1970’s the common feature size was 10 microns. Today many chips are made on a 22nm (0.022micron) process. The cost of equipment to manufacture IC’s on such a small process has been increasing rapidly. The cost of equipment goes up much higher then the the rate of process shrink. Put another way, to half the process technology, equipments costs are significantly higher then merely double. What this is causing is something that has happened, or is happening in most other mature industries. Initially the technology is equally expensive, and accessible to each company, so many companies make the dive into it. As the technoogy becomes more expensive, it becomes more exclusive. A company must have the revenues (by having a very succesful product line) to afford the capital expenditures to move to the next technology. This results in consolidation, many companies do not have the revenues to afford to upgrade their fabs; some companies start out knowing this and operate as a fab-less company, relying solely on contract foundries to make their parts. In the 1970’s and even the 1980’s this was the exception. Today, it is the rule. IC companies simply cannot afford to keep a fab running at the latest tech level. 19 different foundries have 130nm capabilities, a process that was introduced in 2000. This is a fine process for many applications but certainly not very useful for most low-power (such as mobile) applications. At a 32mn process the number of foundries has dropped to only 6 with only 4 of those expected to hit 22nm this year. TSMC is a pure play foundry, they make no products of their own, solely parts for other companies. Globalfoundries is the foundry spinoff of AMD, and now operates much like TSMC. Samsung does both, they make many products themselves (The Apple A4 processor being one of the better known products) as well as provide foundry services for other companies. Intel recently started to experiment with working as a foundry, perhaps to take up any slack they may have in their fabs. One particularly interesting note is that Japanese fabs have not been able, or willing to keep up with technology. 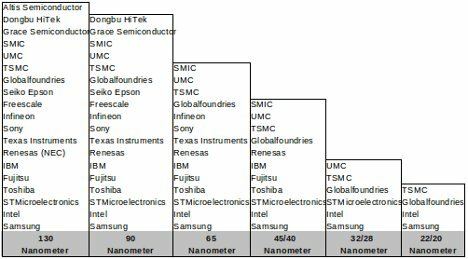 This may have to do with how fragmented that market was, and may change as more Japanese IC companies consolidate (such as Mitsubishi, Hitachi and NEC forming Renesas). This trend will continue as technology advances and becomes more expensive to produce. However, many products simply do not need to be made on the most advanced process. Your toaster oven is just fine with running ICs made on a 130nm process, and thats unlikely to change. As long as there are 3-4 foundries on the leading edge, competition will keep driving advances in technology, and reductions in costs.